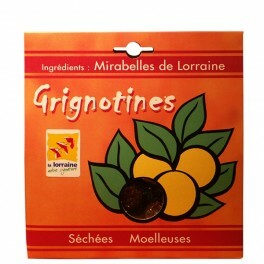 The Grignotines are prepared in the traditional and artisanal Lorraine way. Our mirabelle plums are dried slowly in ovens... Then you can choose to eat them as a snack or to cook. Here are the steps of an artisanal production. After a rigorous selection of fruits, Mirabelle plums are dried slowly in furnaces. When the Grignotines are soft, they are bagged and pasteurized. Therefore they can be stored for two years. There are many ways to indulge in the Grignotines: for a snack with friends or deliciously warm to complement a meat (roast pork, kabobs...). Try them also as a dessert (clafoutis, cakes, flans, ice...). There are a thousand other ways to use them. It is for you to invent the recipe! You can arrange a little presentation.